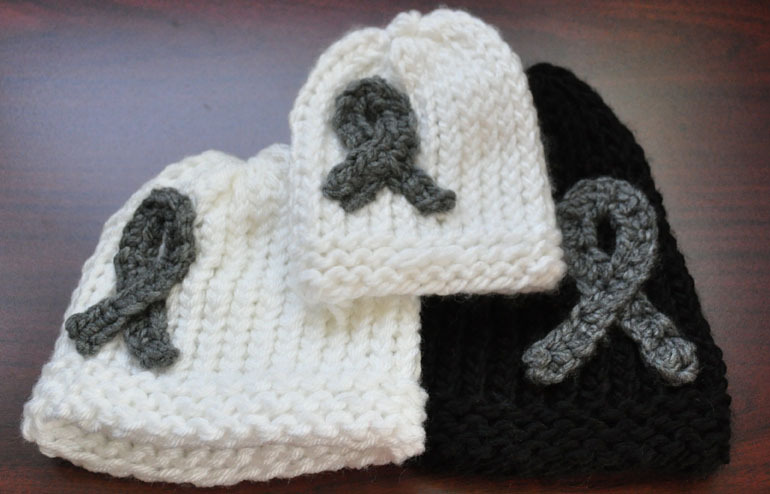 These hats were made for a very special family. 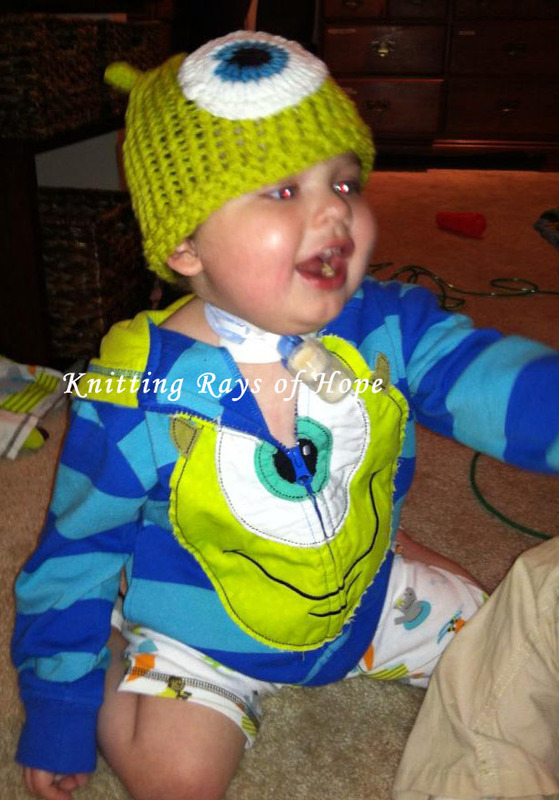 Jennifer lost her 23 month old son, Rylan, to Atypical Teratoid Rhabdoid Tumor (AT/RT). According to St Jude Children’s Research Hospital, this tumor is a rare high-grade tumor that occurs most commonly in children younger than 2. The survival rate for children diagnosed with this tumor under the age of 3 is less than 10 percent. This statistic is just unbelievable! We need to start spreading more awareness about the cancers that inflict children and the need for better treatment options. Jennifer is such a brave and wonderful woman and has been through so much heartache. She told us that she is currently expecting a baby girl, and we knew that we had to make a very special hat for her and her daughter to show how much they love Rylan. The awareness ribbon was the best way we knew how to represent their love and to also help raise awareness. 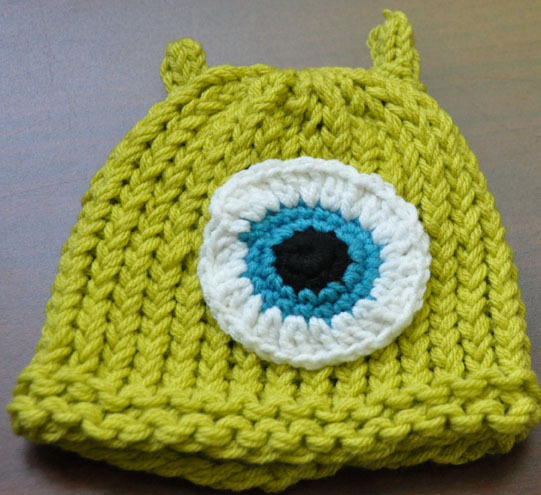 We made 2 hats for Jennifer’s baby girl, since babies grow so quickly. Jennifer is so kind that she donated to us a special amount so that we could continue to make hats for many others. We are truly grateful for your gift and wish you all the best. It is so important that people begin to share the stories of Childhood Cancer so that the world is as aware of it as they are aware of Breast Cancer. You can follow Jennifer on facebook at Ribbons For Rylan. If at all possible try and do what you can to raise awareness. Together we can make Childhood Cancer and Cancer in general a thing of the past. When we connected with Mighty Caleb (link), we also connected with his friend, Jayden. Jayden’s mom informed us that Jayden is “Caleb’s ATRT buddy and would love a matching hat on the other side of the globe”. Jayden is an extraordinary 2 year old boy who has already underwent 7 hours of brain surgery, survived meningitis and began a trial that involved chemotherapy, radiation and chemo with stem cell transplant. Jayden is a true inspiration to us and to follow his story or show support to his family, you can “like” their facebook page (link) and be sure to tell them we sent you. “Jayden proved to be a true soldier through it all and kept on fighting no matter what was thrown at him. Those 8 months proved to be the toughest 8 months of his life thus far and ours as parents to witness. No words can truly describe how crushing and heartbreaking it is to watch your child suffer and not be able to stop it. To hold their hand and tell them everything is going to be ok, when you don’t know that it will. That nothing in your power can make it better no matter how much you wish for it. Jayden is still with us and a happy two year old boy once again, but the fear of his cancer returning some day is with us each day as well. We are just so thankful to Jayden for sending us this wonderful picture to share. Jayden you are so brave and strong and have absolutely won our hearts over with your beautiful smile. We will continue to pray that your fight with cancer is over and forever behind you. This Saturday, 5/18th will be Jayden’s birthday. Please stop by and wish a Happy Birthday to this adorable little boy who has already fought so many battles in his young life. 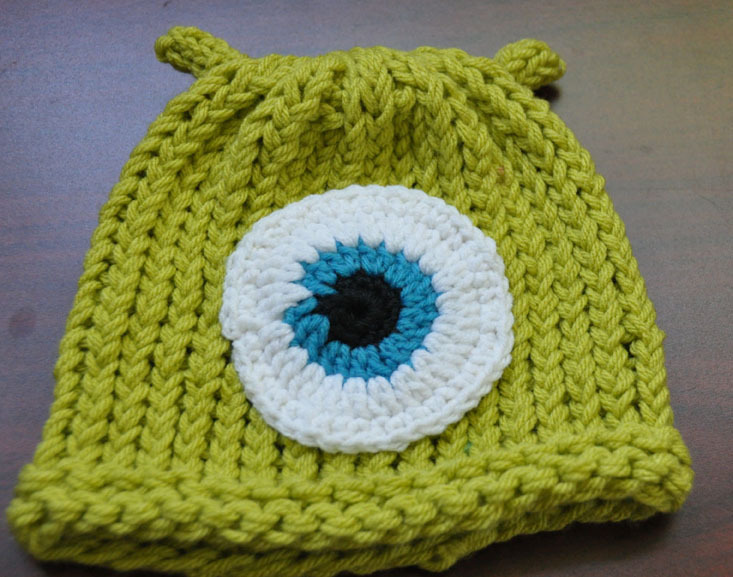 We learned from Mighty Caleb’s mother that he loves Mike Wazowski and is having a wheelchair painted as Mike. Of course, we had to donate this special hat specifically to him. Mighty Caleb is such a marvelous boy, and we are so happy that he is healing and making strides. We will continue to send prayers for Mighty Caleb’s healing to continue and for him to have a wonderfully full life full of happiness. Please stop by Mighty Caleb’s Facebook page and show him some love. 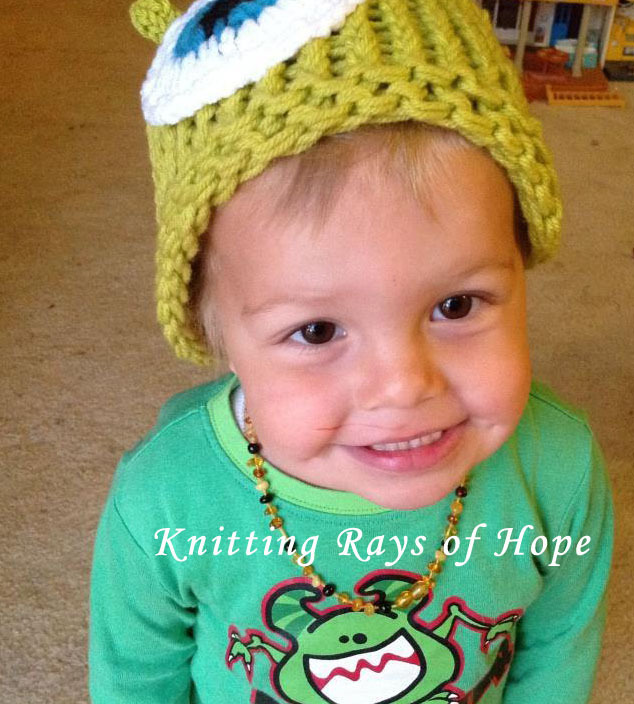 Be sure to tell him that Knitting Rays of Hope sent you. Doesn’t he just make the hat just so much cuter? Mighty Caleb is just too adorable. Where did you find that perfectly coordinating outfit?